Approximately 30 years ago our MD Chris Johnstone, who at the time was a Hill Farmer in New Zealand, saw the need to improve the tools and methods of fence repair. Since our early days, we have developed the product range, introducing new innovative features to ensure that our users get the maximum benefit from investing in our products. We have a manufacturing base in Hamilton from where we produce our tools. All our components and castings are sourced in New Zealand to allow us to control the quality of our products correctly. Our team is a close-knit family, not just a company. We work together to create a range of tools and accessories that we are justly proud. 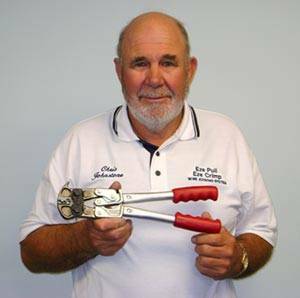 Chris Johnstone, designer and manufacturer of the Eze Pull fencing tools and associated crimp sleeves for agriculture, horticulture and viticulture fencing applications has won several invention and prototype awards at the N.Z. National Fieldays since his first commercial Eze Pull tool in 1986. We were the first company to produce a gritted aluminium sleeve that exceeds the breaking strain of high tensile fence wire. We then went on to design a system that will join all sizes of fence wire in a two-notch tool featured in both Eze Crimp and Eze Pull Ultra Crimp. Over the years we have grown to become the world leader in Fence Tools and Crimp Technology. We have won many awards along the way, but our goal, as always is to help the operator in the field to work effectively and quickly.